The fountain in Havana’s Plaza Vieja is surrounded by fencing, either to protect the fountain or to protect the children. That’s why, with the easing of some travel restrictions to Cuba by the U.S., a popular cry lately has been: “Go to Cuba now, before it all changes!” Mind you, since our visit, what we hear is, “What was it like?” (I gather that many of those who don’t want changes really don’t know exactly what they are trying to preserve.) We wrote about some of our general impressions in this post about what we learned from talking to Cuban people. In its long, slow transition from Fidel to Raul to the future, Cuba won’t undergo any drastic change in the short term. C’mon, it takes months to fix an elevator! Years for the effects of increasing tourism to prompt change. And the embargo–a.k.a. the blockade? That’s not going anywhere any time soon. 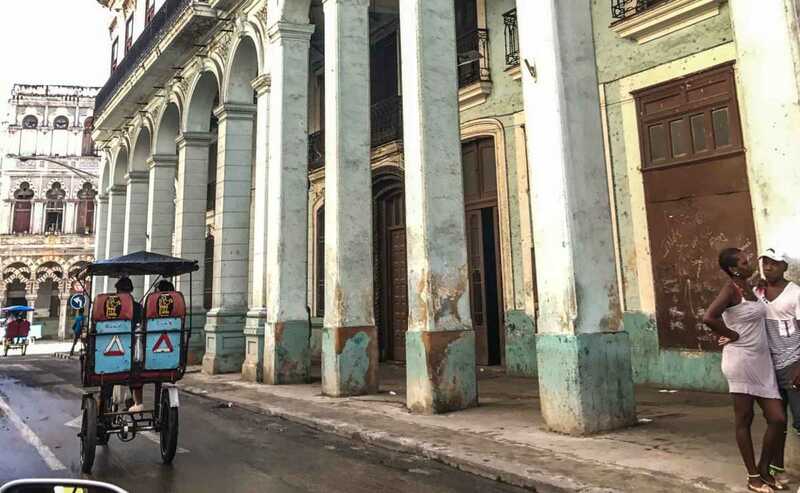 Not all Havana buildings are freshly painted, and not all transportation is via a shiny classic car. So, big changes in Cuba aren’t imminent. Visit when you can. But don’t rush into it thinking you’re catching some quaint fleeting moment that will be destroyed by progress overnight. 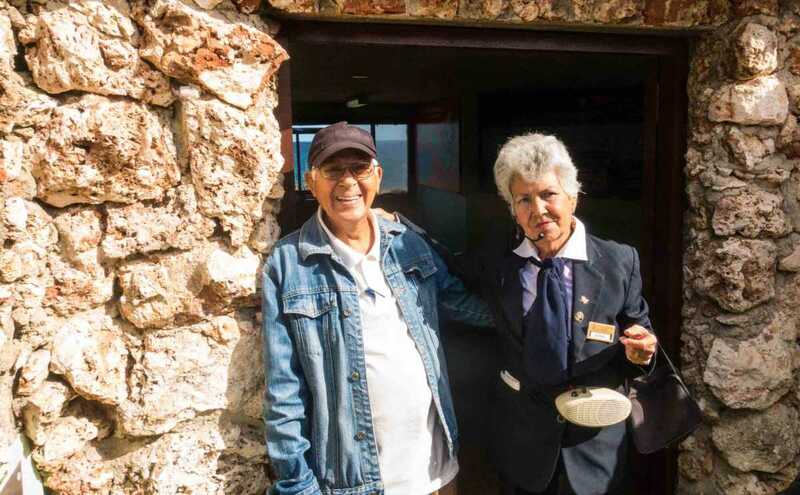 Just because U.S. tourism is in its infancy doesn’t mean Cuba hasn’t been hosting visitors from other countries, building its tourism industry gradually, and protecting historic sites and fragile ecosystems with care. Give Cuba credit. It has a mind of its own. When you visit, you might want to check out some of the places we liked–in Havana and in other towns. Don’t be afraid to book a Casa Particular, a stay in a private home. (‘Privately owned’ places are, of course, tied to government rents and fees.) These can be booked directly via AirBnB or, if you are able to communicate in Spanish by email, you’ll find better rates via www.micasaparticular.com. Casa Naty, Sol 20, Habana Vieja (email: laudino@nauta.cu) – Nice 3rd floor apartment in a very convenient location near the Plaza Vieja in Old Havana. The front door can be tricky to find, but we really enjoyed being amongst local residents, hearing cooking and chatter through the central stairs and open air corridor. For about $10 per person, we added breakfast service: a cook comes in and prepares a nice spread of fruit and eggs. Rolando’s Renta de Apartamento (email: rolandomari@nauta.cu) – We met Rolando by accident, and he took great care of us, including the comfortable apartment, breakfasts served daily by our new friend Meicy, and a ride to the airport. This apartment, close to Hotel Vedado, Hotel Nacional, and the Malecón, also allowed us to walk through the decidedly un-touristy Central Havana toward Havana Vieja, or in the opposite direction to the popular Vedado neighborhood. Touring the battery and bunkers outside Havana’s Hotel Nacional with a couple spry souls who were there during the Cuban Missile Crisis. Hotel Nacional de Cuba – The historic site of mafia business, a casino, and who knows what-all shenanigans. Stay for a night, at least, and enjoy coffee on the patio or drinks overlooking the malecón (sea wall). Walk around to see mementos of all the famous people who’ve passed through here, or take the informative daily tour of the hotel. Even better is a tour of the Cuban Missile Crisis battery and bunkers just a few yards away, overlooking the harbor. La Vitrola – On a corner of the Plaza Vieja in Old Havana. This festive location offers everything from coffee and cocktails to music and vintage decor to complement your rice and beans. 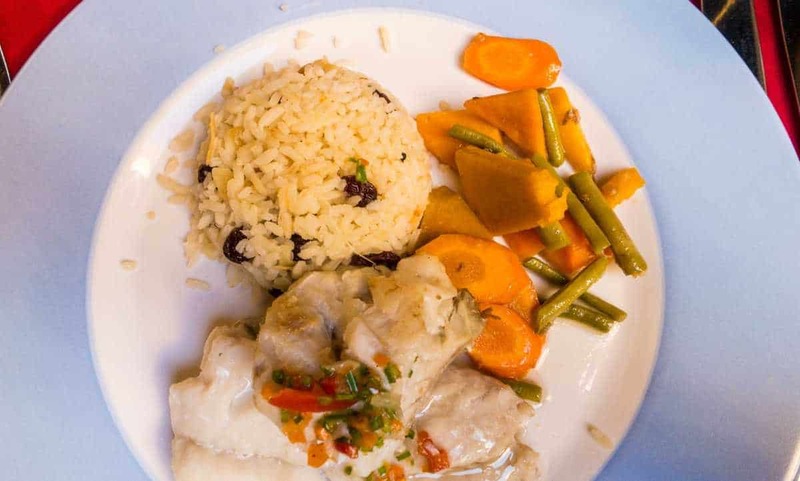 A typical fish dish at Juan Sarda restaurant, Plaza Catedral. Fish is offered to tourists, but is rarely available to local Cubans. Juan Sarda Restaurant – Located on the cathedral square in an accommodating colonial courtyard. Good food here and it’s conveniently located around the corner from La Bodegita del Medio, home of Hemingway’s favorite mojito. D’Lirios across from the Capitolio on Prado, just about a block from the beautiful Grand Theater of Havana. This was recommended by a young Cuban guy we met earlier in the day (who now lives in Paris). He’d recommended La Narga, in the same building, but advised us that if there was a long wait, we could probably walk in to D’Lirios and eat in the bar area. Worked like a charm. Europa (near Hotel Ambos Mundos, the famous hotel which Hemingway frequented). Europa has decent food, very good music, and a great view onto the busy pedestrian street, Obispo. Cafe del Angel Jacqueline Fumero in plaza San Angel. This was our best accidental find. Nice quiet corner and very good cuisine. Casa Muñoz – A casa particular that feels more like a boutique hotel. Julio Munoz started this enterprise when his prior engineering career collapsed along with the fall of the Soviet Union. Muñoz combines his casa particular business with his personal passions, offering photography workshops and horseback riding excursions. This small town was built up with the construction of the railroad connecting Havana with the tobacco plantations to the west. Though it declined in the 1950s and ’60s, it’s still a gateway to the tobacco fields and national parks in the West. Our Sunday visit made the place appear even smaller and more deserted. Vueltabajo Hotel – The sort of place that exudes its former days of glory, emphasis being on the ‘former’. It’s spacious and comfortable, if a little tired. A notably friendly bartender provided me with ice for my knees, twice. El Meson 1995 – One of the most ambitious meals we were served, with course after course of meats and vegetables spread out before us. Unfortunately, we’d stuffed ourselves earlier in the day. Villa Lagarto – Beautifully situated on the point of Península Gordo, this cozy place with good views specializes in whole roasted pig. Restaurant Doñanora Calle 37 and El Prado in the center of town. 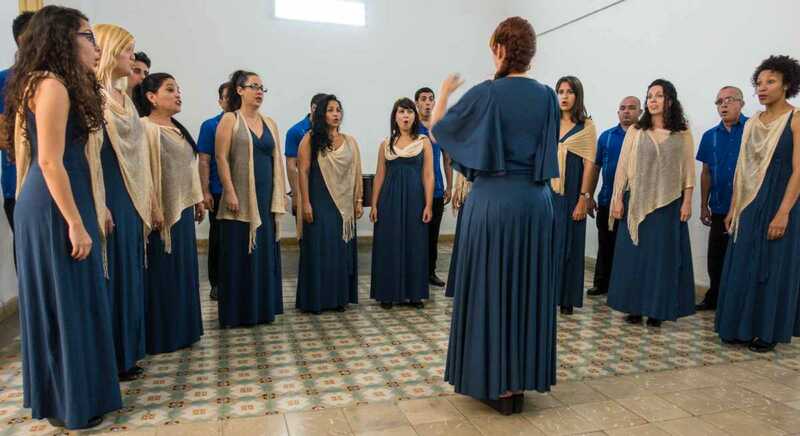 Take a stroll through the historic town square nearby, especially to see El Teatro Tomas Terry. This chill little town is a popular jumping off point for water sports. Hotel Enrique – Offers a rooftop bar, plenty of rooms for your group, and delicious dinners. NOTE: In some cases, we visited the restaurants and accommodations named here on our own; in other cases we were hosted and guided byCuba Unbound. To read more about our Cuba Unbound tour, hiking Cuba’s National Parks, see our earlier post here. Read our post about Why You Should Visit Cuba now. I love Cuba and have been there three times. As a Canadian, we’ve never had any restrictions on travel to Cuba, although there are some restrictions for everyone as to where exactly you can go once you get there. We found the people to be friendly and truly loved the vibe and the music. As well as the history and the beaches. Now … I’ve got to go back, as their chocolate industry is beginning to flourish. Cheers! I’d love to talk to you more about your trips to Cuba — and join you when you do a chocolate tour! I would love to visit Cuba this year and really explore the country before it changes, lovely post. Thanks, Noel. Let me know when you are going and we can compare notes! Thanks for the tips. I so need to make my way to Cuba before it all changes. Elaine, you have time. Let us know what you think once you’ve visited. I can’t believe I still haven’t been to Cuba, it’s so popular with Canadians and my sisters go often. It might have to be my next destination. It really appeals to a variety of travelers, I think, especially those looking for culture, water sports, nature. Hope you get there soon. I think you’d really enjoy it. The food, by the way, can be quite good, though many complain that it never varies. I was inspired to cook a delicious meal of pork with rice and beans when I got home – accompanied by mojitos, of course! While we Canadians have had access to Cuba for decades, I’m ashamed to admit that when I went 20 years ago over New Year’s it was mainly for golf and snorkling. Obviously I missed out on the more interesting aspects….the towns, the unique food, the history, the culture and the food. Guess it will have to be a future trip. I think we should all return to places we enjoyed when we were in our 20s, and see what we missed! We traveled to Cuba before the embargo was lifted so I’m sure some things have changed. However, as you mentioned it’s going to be a long time before it will be of interest to some travelers. And that’s too bad because we so enjoyed the Cuban people and the food. Great story! And the embargo is still in effect for the most part. Fortunately, the spirit of the people isn’t diminished. I’d like to return just for a music tour! I’m planning a visit to Cuba at the end of August. Great information here since several of the cities on my list are here. Where will you be flying from, Patti? We were able to book a reasonable itinerary via Orlando. So we avoided the much more crowded Miami customs, and spent a couple extra days visiting family and Disney in Orlando. Now that Southwest flies to Cuba, I’d like to try and use my points. However, SW’s international flights run on a very limited schedule, so it might not be possible. What airline did you use? Orlando would be much more convenient than Miami. I see you have a new post on Cuba….looking forward to reading it! What a fantastic resource for people to use on a trip to Cuba…it sounds as though you met some fascinating people. I’ll definitely check out Cuba Unbound. Thanks, Michele. We can recommend Cuba Unbound. I keep eyeing their kayak trips….hmm, next time? Almost everyone flies to Orlando, so getting there shouldn’t be a problem. We took Sun Country from MSP, which had the best fare at the time. From Orlando to Havana and back, we took Jet Blue. Our first time on Jet Blue and it was very nice. We would probably drive to Orlando. Jet Blue from Orlando to Havana…okay, got it! Thanks!! !